A recent three-part series (Part 1, Part 2, Part 3) on fracking attempts to compare the Marcellus Shale boom that has taken place in Pennsylvania with the situation in New York surrounding the state’s ban on high volume hydraulic fracturing. But the picture the author, Tom Wilber, paints, is lacking in the facts. That’s not entirely surprising considering that Wilber is also the author of Under the Surface, a book that essentially maligns the oil and gas industry. Wilber missed the opportunity to explain the incredible benefits—jobs, taxes, community spending, infrastructure repairs—that have occurred in Pennsylvania, while New York has languished. Instead, Wilber uses this series to imply that the economic promise of fracking was overstated—a point we’ll address more in a moment—and that New York chose the environment over the perceived economic potential. The reality is that activists and politicians in New York never even gave the state’s residents a fair shot at experiencing a fraction of the economic prosperity other parts of the country have seen. “The promise seemed too good to be true. And, for New York, the promise wasn’t enough. “To justify the ban, the Cuomo administration produced a 184-page literature review of recently published research papers. But, as detailed in our whitepaper, we discovered significant and undisclosed ties between some of the research used to ban fracking in New York and the political campaign to ban fracking in New York. For example, one paper was written by fracking opponents who actually used buckets lined with plastic bags to take air samples near oil and gas wells. You might think this kind of paper would get shot down in the peer-review process. But the peer-reviewers were also fracking opponents. One of them was Sandra Steingraber, the co-founder of New Yorkers Against Fracking, the state’s leading anti-fracking campaign group. Wilber identifies Steingraber as “an Ithaca College scholar and a high-profile activist and organizer in the Finger Lakes region,” when he quotes her in Part 3, but he fails to mention her anti-fracking activism or her deep-rooted ties to the “research” behind the ban in his article. Likewise, when he quotes Cornell University’s Tony Ingraffea, who he calls “one of [the industry’s] harshest critics,” he presents the professor as an expert on fracking, despite the many debunks of Ingraffea’s research and Ingraffea’s own claims that anti-fracking advocacy is included within his reports. These activists have skewed the facts surrounding the fracking process, and, as such, left New York in an unfortunate situation. After all, as Pennsylvania has shown, the decision to allow fracking in a state is not a choice between the environment and the economy. These resources are being developed in a way that is beneficial to the economy and protective of the environment. The New York ban presented a false choice and those residents have missed out because of it. “But hindsight in Pennsylvania shows initial economic projections and job estimates were grossly inflated, much of the wealth has left the area, industry has alienated some of its most supportive allies, economic returns remain precarious as prices fall and regulators have failed to protect the public against predatory exploitation. FACT: Earlier this year, under direction of Pennsylvania’s Governor Wolf and his secretary of planning and policy, John Hanger, the state revised its methodology for how jobs are calculated in the oil and gas industry. Previous estimates included 29 ancillary, or support industries, in addition to the direct jobs created by the shale industry, while the new estimates only include six. The previous estimate also included the entire state and now these estimates are limited to just the Marcellus Shale region, eliminating any workers who may travel from across the state for employment. There are some concerns with this new methodology: the way jobs are now calculated makes it unclear if support staff or individuals like those employed with EID would be counted in the final tally, despite our obvious industry affiliation. However, the new number is still nothing to take lightly with nearly 90,000 people in Pennsylvania estimated to be employed in the shale industry in the third quarter of 2014. What’s interesting is Wilber seems to scoff at the number of jobs this new estimate established because it’s not as high as previous estimates. But it’s still nearly 90,000 people employed. It’s nearly 90,000 families earning sustainable wages. It’s nearly 90,000 people paying taxes and spending money in their communities. What single industry in Wilber’s home state of New York came in and has done that in under a decade, let alone maintained those numbers as the industry as a whole has struggled over the last couple of years? Wilber certainly doesn’t offer up an example of an equivalent industry in New York and the unemployment figures in Upstate New York lead one to assume those residents wouldn’t have turned away tens of thousands of jobs. Claim 2: “Industry is generating millions of dollars in “impact fees” to small-town economies to buy good will near drilling sites in lieu of a more costly state tax. The fee is collected retroactively, so in 2015 the state total amount of impact fee money for wells in 2014 was $223.5 million. Most of that money goes back to the rural communities that actually have oil and gas development and therefore local impacts. For instance, the Pa. Northern Tier, just under New York, received roughly $48 million to spend on roads, infrastructure, local school, emergency services and other municipality and county needs. The grand total since Pennsylvania began collecting the Impact Fee in 2013 has been $850 million, in addition to property, school, retail and other taxes paid by the industry. That’s also not counting the additional investments companies have made in the region. Wilber talks about Cabot Oil and Gas throughout his series, but never mentions the company is the reason a much needed multi-million dollar hospital was build in Susquehanna County. Cabot paid for directly or helped fundraise a large portion of the money needed for that project that the county had been trying to complete for decades. Chesapeake Energy, another company Wilber mentioned in his series, invested more than $300 million between 2010 and 2012 in roads in northeastern Pennsylvania. In parts of the state, Chesapeake actually spent more on roads than the state Department of Transportation (PennDOT). Again one has to wonder, what companies in New York are investing those kinds of dollars into the communities where they operate above and beyond what they are required to pay the state? FACT: Fracking has absolutely brought an influx of money that has helped Pennsylvania’s rural communities. In Part 1, Wilber displays a chart that he never actually discusses showing bank deposits in three Northern Tier Counties (bordering New York), from 2006 to 2015. 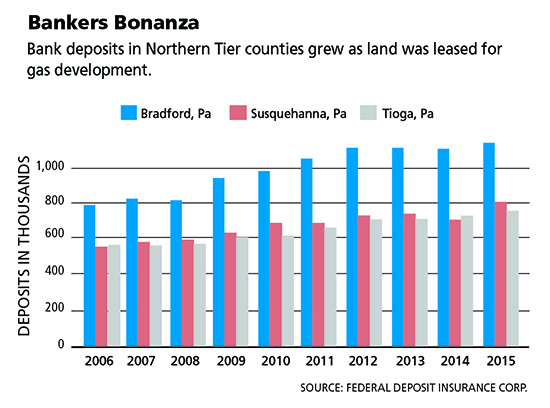 The chart says that the deposits grew “as land was leased for development,” but fails to acknowledge that the chart even shows that in recent years when less leasing was taking place, those deposit amounts have remained higher than the pre-Marcellus amounts in 2006. That’s the result of not only leasing, but jobs and royalty payments in the region that have helped residents sustain their earnings. And these increases would likely occur with any growth in population like the region has seen. Given that just this year Wilber released an update to his book, Under the Surface, which focused heavily on the controversy in Dimock, it’s really no surprise he wrote an entire article in the series on the community. What is shocking is that not once in the entire article—more than 3000 words—did Wilber actually share with readers the determination of the federal Environmental Protection Agency (EPA) in Dimock. He goes through the initial complaints, quotes a couple of landowners, uses the story as a platform to criticize Pa. Department of Environmental Protection’s (DEP) regulatory framework, but not one time does he mention that both DEP and EPA found the water in Dimock to be safe after multiple water tests. That’s a pretty important detail to leave out when discussing an investigation as if it’s still ongoing, especially since that determination was made in 2012 around the time his first edition of his book was released. He also highlights a family that wasn’t discussed in the original Dimock stories, Ken Morcom. The family has had issues with methane in their well. While Wilber acknowledges Cabot has been working with the family to fix and while he embeds a video of Morcom talking, he doesn’t actually share in the article what the landowner had to say about the issue with his well. Why wouldn’t Wilber mention any of this? Instead he simply portrays the family as one with issues, implying that this issue has defined their experience or opinion of the development around them. “By enacting a ban on fracking earlier this year, the administration of New York Gov. Andrew Cuomo has shown zero tolerance for shale gas risks to the environment and health. Yet New York’s appetite for cheap gas produced by the shale boom in Pennsylvania and Ohio is big and growing bigger — a jump of nearly 18 percent from 2009, according to figures from the federal EIA. In other words, New Yorkers are benefitting from the development of shale gas, but they can’t benefit from developing their own shale gas. And Wilber even acknowledges that “a well-organized group of fossil fuel opponents who, having stopped fracking at New York’s borders, are shifting their focus to keep Pennsylvania’s glut of fracked gas out of New York.” But where Wilber starts to leave off valuable information again is when he gets into the discussion of clean fuels and New York’s plan to eventually become 100 percent renewable. At the end of the day, Wilber left a lot of important information out of his analysis. The reality is the Marcellus Shale has had tremendous economic impacts in Pennsylvania, and certainly would have in New York as well. A politically motivated ban prevented that from occurring for the state based on the misrepresentation of situations like those that occurred in Dimock. Now those same individuals are attempting to prevent consumers from benefiting from the affordable costs of natural gas as well. One only has to look across the border of the Twin Tiers to see that Pennsylvania has flourished in recent years, while New York has suffered economically—and that’s no exaggeration.